A new boiler doesn’t have to cost the Earth. Working alongside Hitachi Finance, C.S Heating is able to provide finance options to suit all budgets. With our ‘Buy now, Pay later’ scheme, you can purchase a new boiler, interest-free for the first 12 months. 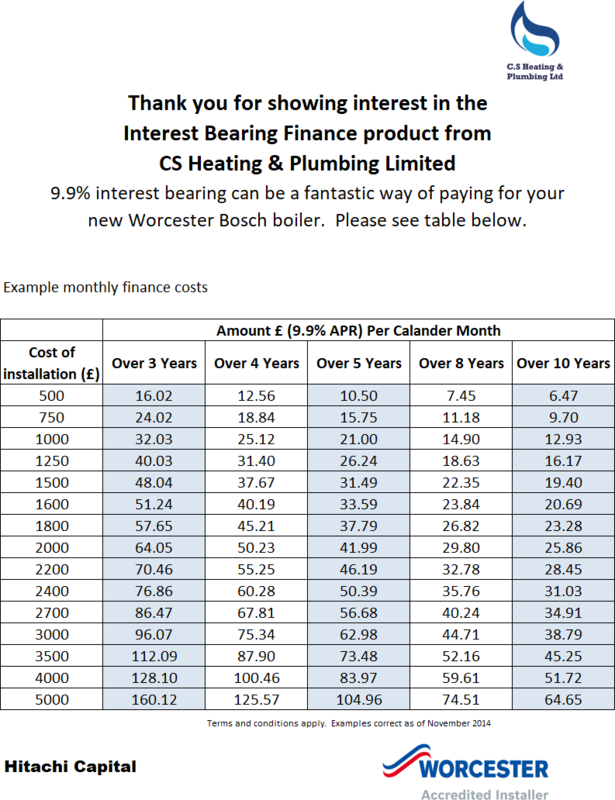 Alternatively, you can choose a 36-, 60- or 120-month scheme which allows you to pay for your Worcester Bosch boiler in monthly instalments at just 9.9% interest. Full finance - CS Heating & Plumbing is authorised and regulated by the Financial Conduct Authority in relation to credit brokering *Reg no. 787364. Credit is provided by Hitachi Personal Finance, a division of Hitachi Capital (UK) Plc authorised and regulated by Financial Conduct Authority. C S Heating & Plumbing Limited Unit 88 John Wilson business Park, Whitstable, Kent, CT5 3QT.